The spirit of these rules is to ensure a fun environment and participant enjoyment. All games are to be played in a sportsmanlike manner. If necessary, the Board of The Southside Kickers Kickball League (AS A WHOLE) will address any inconsistencies, discrepancies, and misunderstandings in accordance with the spirit of these rules. These rules are subject to change without notice. 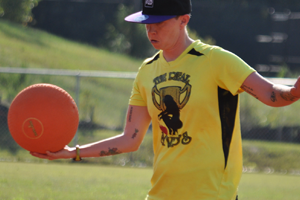 To be eligible to play with the Southside Kickers Kickball League, a player (female) must be 21 years of age or older. The pitcher must pitch the ball from behind a diagonal line or encroachment line painted from 1st-3rd bases and directly in front of home plate. Distance between bases is 60ft. Two green mats (12”W x 17” L) will be placed on both sides of home plate to aid in the visual of the strike zone for players. When a ball rolls over any part of the green mats it is a strike. No NEW PLAYERS may be added to the LEAGUE roster after the 2ND game of the season. New players must fill out a waiver release form, fill out medical insurance form, and be added to the roster prior to the 2ND game. Players may only play for one team in The Southside Kickers League within the same season. The league requires that all players’ name and signature be entered on a Southside Kickers League Roster for GENERAL Liability Insurance purposes before entering the field of play. Referee will call the GAME to start. EVERY Game must start on time with 5 min grace for the GREETING/EXCHANGE OF “KICKING ORDER/ ROSTER” (2) between each HEAD COACH AND the SCORE KEEPER. All players playing the field must be in the kicking order. Any players that are not playing the field can still be in the kicking order. If a player is scratched from the kicking order during the game due to an injury, they MAY NOT return to the game. The kicking order shall not change. Any player found to be playing (not on roster / not paid in full/ under age / under the influence of alcohol or any illegal substance) will be suspended and their team will forfeit the game the player participated in. 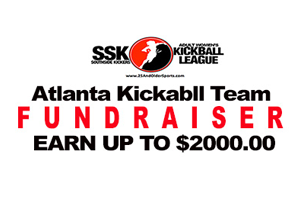 If a player who is in the game is believed to not be on the liability and insurance roster, the game will continue, but then the game may be protested to the BOARD of the Southside Kickers Kickball League by the following day at 10am. The team manager must verify identity of that player by ID check. If a player is found to have played in a game without being on the roster, it is an automatic forfeit for the team using the illegal player. Each team must have at least 10 players on the roster with a maximum of 21 players. You can field a maximum of 10 players. 10 Players 4 outfield 6 infield. 9 Players – 3 outfield 6 infield. 8 Players – 3 outfield 5 infield. All players in the infield area MUST remain behind the 1st-3rd base line until the ball is kicked, with exception of the catcher. 1ST INNING ….VISITORS KICK FIRST ….HOME TEAM IS OUTFIELD which will be determined by the league schedule. BE ON TIME!!…. A LATE PLAYER may not be added to the kicking order roster AFTER the start of the game. After 2nd INNING ENDS any player in the kicking order that has not arrived will be an OUT for every inning thereafter. A team failing to field at least 8 players within 15 minutes after the scheduled game time, the team will forfeit the game. All forfeits are counted as losses. 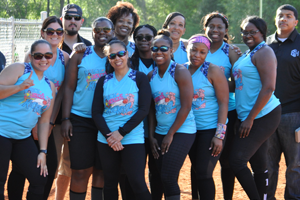 Forfeits are frowned upon, but if it is an emergency and a team cannot field enough players (8-11) to participate in today’s game, the team manger is responsible for contacting the opposing team they are scheduled to play and the League Director / Asst Director as soon as possible inform the League of any forfeiture of a game. 2 kicking orders must be turned in per game! or tanks are highly recommended to help catch perspiration. (Regular shorts, bike shorts or leggings) must be worn with uniform top to each game. 4. Coaches must have rule book and first aid kit in dugout during all games. Regulation games are a total of 5 complete innings or 45 minutes whichever comes first for Regular Season games only. The umpire will manage the official time. Games will not end in a tie, will play one extra inning then move to Sudden Death (see Sudden Death rules). A game that is called off by the umpire due to inclement weather or other reason, after 3 full innings of play shall be considered a regulation game. The game score at the end of the last full inning shall determine the winner. If a regulation game that is called after three innings end is a tie, then a Sudden Death inning will be made up the next available Sunday. During play, the Head Coach may request a maximum of 2 timeouts that cannot exceed 1 minute each. On defense we have an Open Substitution Policy, which means you can Sub players on defense between innings without notifying the scorekeeper or the umpire. A total of 7 complete innings or 60 minutes whichever comes first for Playoff and Championship games. No substitutions are allowed in kicking order. Substitutions can be made for base runners that are injured, it must be the last player that was called out in the current inning or the last inning if no batters were called out in the current inning. The umpire will make the judgement as to the legitimacy of a injury or not. No player may advance forward of the 1st – 3rd base diagonal line until the ball is kicked. If a base runner is hit by a kicked ball and is not on base, the base runner is out. If a base runner is hit by a kicked ball while on base, the base runner is safe. If a runner intentionally touches or stops the ball, even if they are on base, the play is stopped and the base runner will be called out. Players in the field are allowed to kick the ball (as opposed to throwing) towards another player on their team in the field. This is particularly helpful if you have a long throw from the outfield. Bouncing pitches are allowed. The ball must bounce 2 times before reaching the plate or the second can be on the plate itself. Any pitch that does not bounce at least twice before reaching the plate is called a ball as it is an illegal pitch. A pitch that is higher than 12 inches at the plate, and called as such, results in a ball. If the ball falls short of the plate and does not cross over, the pitch will be called a ball. The pitcher must stay BEHIND THE ENCROACHMENT LINE until the ball is kicked. Failure to do so will result in a ball. Pitchers may only be replaced ONCE per inning. Each player must kick in order as it is written on the Kicking Order turned in before the game. Catchers must remain behind the kicker until the ball is kicked by the batter. The catcher may move up from behind the kicker after the ball is struck. Any ball kicked at or above the knee will be a called foul ball unless caught by a fielder. Ball is also live if caught in foul territory, which allows base runners to advance after tagging up on a caught foul ball. Any ball kicked from in front of home plate will result in a foul ball being called against the kicker, if it is after the second the strike, it will be out as the result is a 3rd strike. Runners must stay within a 4 foot base path between 1st-3rd bases. Fielders must stay out of the baseline. Fielders trying to make an out on base may have their foot on base, but must stay out of the base path of the runners. Runners blocked by any fielder within the baseline shall be safe at the base in which they were running. When running to 1st base you MUST touch the orange bag or runner’s bag. The runner can turn any way she wants after she has secured 1st base, as long as she does not cross over the foul line into fair territory. If she does, she can be tagged out if she doesn’t make it to 2nd base safely or back to 1st base before being tagged. When running to 2nd or 3rd base you MUST stop on the base in order to be considered safe, if you overrun the base you can be tagged out by a defensive player tagging you before you return to the base you overran. The only base where you can run through the base and return to it safely is 1st base. The play ends when all runners have reached a base and the pitcher has control of the ball in the circle on mound and time is called by the umpire. Neither leading off base nor stealing a base is allowed. A runner off of their base when the ball is pitched shall be called out. An injured player may be replaced with another team member only if they made it to the base. That player must be THE LAST PLAYER TO MAKE AN OUT in the kicking roster. If a base runner advances in front of another runner or touches the runner in front of them, they will be called out. Even if the ball touches the fielder and ricochets off the defender and hits the runner, if below the shoulders, the runner is out. A player can not intentionally throw a ball at a base runner’s feet. If it is believed to be intentional then the base runner will be called safe. If the runner intentionally uses their head to block the ball, that runner is out. TAG UP RULE: After a kicked ball is caught, runners must go back and tag their originating base before running to the next base or stay on the current base until the ball is caught before advancing to the next base. Base runners can advance on caught foul balls, which in turn means a caught foul ball is live ball not a dead ball. ADVANCE TO ONE EXTRA BASE is awarded for an overthrown ball. A ball is considered an overthrow if it leaves the field of play or goes into the dugout on a throw to first or third base. If a ball is overthrown and stays in play, runners may advance due to the ball being live. If an overthrow hits a player who is inside/or outside of the dugout, who is not a fielder, the ball is dead. 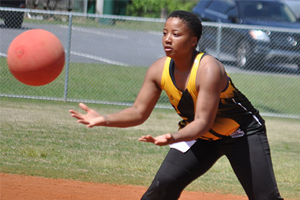 First Touch: A runner who is in CONTACT with a base, can legally leave that base and proceed to the next base AFTER any defender makes FIRST contact with the ball.Thus, ONCE… the ball is bobbled or tapped by a defender, the runner can proceed to the next base. It doesn’t matter if the ball is subsequently caught or dropped. (What’s important is the runner starting from being in contact with the base.) This First touch rule DOES NOT replace nor negate the TAG UP rule. A pitch that rolls within the strike zone either not kicked, or missed by the kicker. *A count of 3 strikes is an out…. A kick occurring in front of home plate (kicks occurring in front of home plate that are caught by the fielding team are called out). A count of 3 balls allows the kicker to advance to 1st base. A ball falling short of the plate and does not cross the plate. A bouncing ball that is higher than 1 foot as it crosses home plate. Any fielder-advancing forward of the 1st – 3rd line (Encroachment Line) before the ball is kicked. Any catcher-advancing forward of home plate before the kicker kicks the ball. The pitcher must stay behind the 1st– 3rd diagonal line (Encroachment Line) until the ball is kicked. Failure to do so will result in a ball. Any kicked ball landing out of bounds. Any ball kicked at or above the knee. Any ball kicked from in front of home plate. A runner touched by a ball at ANYTIME while NOT on base. Any kicked ball that is caught. A runner off of the base when the ball is kicked. If the kicker touches a pitched ball with her hands. A mercy rule is applied when a team is ahead by 20 runs after 3 innings 3 FULL innings have been played, the game is over. And if the winning team has the last kick they are not allowed to kick. Sudden Death is played only after we have played another inning and a winner has not been decided. The last batter out goes to 2nd base and the next batter will bat with 2 Outs and a full count (3 Balls and 2 Strikes). And from there we play the inning, both teams are given the opportunity to score a run in sudden death. League standings will be posted each week along with scores. Standings will be arranged according to wins/losses first, then points for, then points against, and head2head. League standing tiebreakers will be decided by head2head first, then points against, and lastly points for. The playoffs will be determined at the completion of the last games of the season. The playoffs will be a tournament seeded style tournament with the Top 4 seeds having a bye until the 2nd round. The lower seeds will play a 1st round elimination game and the winners move on in the playoffs rounds until we have a League Champion.